Ambient Grab n Go 1000mmwide. Refrigerated Grab n Go 1000mmwide. Heated Grab n Go 1000mmwide. Ambient Patisserie (back service only) 1000mmwide. Ambient Patisserie (back service only) 1400mmwide. 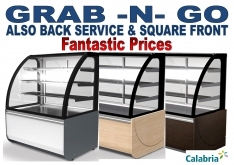 Refrigerated Patisserie (back service only) 1000mmwide. Refrigerated Patisserie (back service only) 1400mmwide. Heated Patisserie (back service only) 1000mmwide. Thanks to its double glazed glass, it is the perfect cabinet for maintaining food in perfect conditions even in low temperatures. As a standalone cabinet with compact dimensions and easy maintenance, Calabria is the recommended choice for small premises that want to optimise their pastry product’s presentation, while maintaining suitable preservation conditions. • Neutral, refrigerated and chocolate version. • Ventilated cooling system (forced air). • Using only refrigerants (R404A) that comply with the environmental legislation. • The CFC free polyurethane insulation is injected at high pressure to a density of 40kg/m³. • Double glazed rear doors. • Frontal glass single (ambient) or double (refrigerated) glazed. • Double glazed side glasses. • Lacquered or wood side panels. • Lacquered or wood frontal panel. • 4 levels of interior lighting. • Large volume of refrigeration. • Lengths of 1100 and 1400 mm.